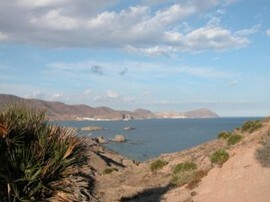 A self-guided walk along the wild coast of Andalucia, in the Cabo de Gata natural park. In the south of Spain, in the Almeria region, the natural park “Cabo de Gata ” offers more than sixty kilometres of wild coast. Classified as a biosphere reserve, the Cabo de Gata is an area of desert and its exceptional landscapes are often used in films (including Indiana Jones). This itinerary crosses the natural park from east to west along the wild coast and its beautiful ” calas “. Each evening you will stay in one of the typical white villages of Andalucia. An ideal walk in spring or autumn, or during the winter for clear skies and some sunshine. Walk between 4.30 hours to 6 hours per day along easy terrain. Day 1: Arrival in Carboneras. We will arrange for you to be transferred from Almeria to your first hotel. Day 2: After visiting the “Playa de los Muertos”, climb the “Mesa Roldan”. From this headland, at 200m, you will have a marvellous panorama over the coast and the Cabo de Gata mountains. Walk down to Aguamargua, a small unspoilt fishing village. Day 3: Walk on the ” Sierra de la Higuera ” to get to the village of La Negras, along the “calas” of Enmedio, el Plomo and San Pedro. Probably one of the wildest and most spectacular walks in the itinerary. Day 4: Following the coast, you will arrive to the Cerro de los Lobos at 265 m. This coast is classified as an integral marine reserve. Here is a haven for wild birds, including the elusive Osprey. Walk down the valley to Rodalquillar. Day 5: Change of scenery for a walk inland. Visit the old gold mines and climb the “Lomillas de las Palas” at 297 m from where you can see the Sierra Nevada. Back to the coast, to the village of La Isleta del Moro. Day 6: A walk through the marine reserve of La Punta del Lomo which is the only area in Europe hosting bird colonies arriving from North Africa. After climbing the tower of La Cala Higuera, walk down to the port of San José. Day 7: From the lighthouse “Faro de Gata”, walk back to San José . This itinerary will allow you to discover the geological richness of the volcanic beach “Playa del Monsol” and the white cliffs of Cerro de Vela Blanca. To finish, walk along the “Playa de los Genoveses “, beyond all question the most spectacular of the region.